Paper presented at the 16th annual conference of the Center for Iranian Research and Analysis held at Portland State University's Middle East Center in Portland, Oregon, on April 24-25. Hossein Bagher Zadeh is chair of the Iranian Human Rights Working Group (IHRWG), an Internet-based organization. The time for an historic national reconciliation in Iran is getting close. Forces of antagonism and intolerance are on the retreat, and the national mood is warming up to the peaceful transition to a civil, democratic and lawful society. President Khatami is keeping up with his election promises, within his limited scope of power, and his administration is facilitating the move toward a more open and lawful society through small but effective measures. For this process to be successful, it has to lead to the lifting of the severe restrictions which have been imposed on the freedom of the press and activities of the opposition forces over the last two decades. This may prove to be the most delicate and sensitive step in the context of these developments. Not only are there powerful opposition groups who are bent on the violent overthrow of the government, but also a large section of the society has great grievances over the brutal actions of the security forces in the last two decades which have led to many thousands of deaths and other violations of basic human rights. The society will need to take preemptive measures and put in place procedures to deal with these grievances without allowing them to lead to yet more upheavals and/or violent consequences. In this talk, models adopted in other societies recently going through a process of national reconciliation (notably, Nicaragua, South Africa, and Northern Ireland) are examined and the results of their operation are evaluated. Then lessons are drawn from these examples, and with characteristics of the Iranian society in mind, a model for a similar process in Iran is proposed. A significant number of societies around the world have gone through a democratization process over the last two decades - and especially since the collapse of the Russian-dominated Communist bloc in Eastern Europe in the late eighties. In some cases, like the latter-mentioned countries, the process has gone through with small upheavals, with the new order replacing the old in what has been termed by the Czechoslovaks as a 'Velvet Revolution'. The old guard, though had ruled with absolute power, had inflicted little physical pains on the population, and as a result, relatively few had to face prosecution or suffer revenge in the hands of the liberated masses. The society could easily put the past behind it, and it soon accommodated both the old and new to compete in a pluralistic democratic or quasi-democratic structure. There were not much old wounds to be treated or old scores (of physical oppression) to be settled. In Rumania only few top officials lost their lives, and in East Germany only a handful faced criminal charges and were prosecuted. National reconciliation in these countries was achieved as part of the transition to a form of pluralistic democratic society with little difficulty. Then there is the case of countries like Chile and Argentina, where the dictatorship rules had been characterized by systematic violence and brutal suppression. These societies, too, have made a transition from dictatorship to a sort of political democracy, but without addressing the issue of national reconciliation. The old guard (or at least its instruments of oppression) stayed in power and those oppressed during the long years of bloody oppressions were denied the chance or the right to know who was responsible for the gross violation of human rights against them and their relatives; why did they have to suffer these atrocities, and what had happened to their loved ones. As a result, justice has become a victim of political expediency with old hatred and animosity entrenched in the psyche of the society to the detriment of any attempt for national reconciliation. Not only that, but the fledgling democracy remains a hostage to the generals and their death squads with the danger that they could spring into action and resume their old tricks whenever they find it opportune. Or else, the great reservoir of resentment and feeling of injustice amongst the population, and their despair of the democratic process to address their grievances, may erupt into yet another cycle of violence and armed struggle as a natural response to what they would see as a continuation of oppression under the democratic disguise. While many who have been instrumental in the machinery of oppression over the last two decades in Iran may wish for the current pro-democracy movement to not go further than the experiment in Chile and Argentina, it is very unlikely for structural reasons that their wish may materialize. The practice of oppression in Iran has been too overt and naked for the perpetrators to deny their deeds or to hide their identities behind their masks. A great number of officials, some of them in high positions, have had a direct hand in many of the gross violations of human rights including torture, killings, and denial of basic human rights to a majority of citizens. They should be under no illusions that once a resemblance of the rule of law is established in Iran, they would be called to account for what they have done over the last two decades. It should be obvious to all that countries like Chile and Argentina can in no way be used as models for a successful transition to a democratic society and national reconciliation in Iran. Successful examples of transition to a civil society with national reconciliation at its cornerstone can be found elsewhere, in countries with violent past and some other similarities with the Iranian society. Three of these examples, namely Nicaragua, South Africa, and Northern Ireland are studied here to see what lessons, if any, can be learned from them for the Iranian situation. All these three countries, like Iran, have gone through a violent past. However, the nature of the violence and its mechanisms have been different in these societies. Nevertheless, it is significant to note that the Iranian experience has common features with each of these societies. In the case of Nicaragua, the similarities predate the Islamic Republic. At the time, the two countries, both in the same league of nations (classified as developing countries), and both having been ruled by corrupt, autocratic, ruthless U.S.-supported regimes for a long time, went through similar bloody but successful revolutions almost at the same time. Too many commonalities and similarities exist between the two. However, all these similarities stopped at the point of overthrow of the old guard, and there the two revolutionary processes parted company. While one, i.e. Nicaragua, put national reconciliation at the heart of its policy, the other, Iran, embarked on what could be called a national revenge policy. Once in power, the Sandinistas, as a first step abolished the death penalty altogether. The Islamic Republic, on the other hand, lost no time in setting up the execution machines in its makeshift headquarters. The two sharp contrasting gestures charted the course of events to come. While the Nicaraguans soon went through a national reconciliation process, and after some years of hardship and resistance to a U.S.-led war of attrition, transformed into a pluralistic society, with little difficulty, the Islamic Republic compounded national divisions and acrimonies to new heights with widespread use of torture and executions on a scale almost unparalleled in the world during the eighties. The experience of war too, which was shared by both nations, exhibited entirely different approaches by the two systems. The Islamic Republic, used the war against the neighboring Iraq as a pretext to extend its machinery of oppression and executions against its opponents and dissidents. In Nicaragua, in contrast, the devastating war powered by the mighty U.S. government cold provide no such excuse for a single execution of its opponents or collaborators in the war. In the case of South Africa, the similarities are more striking and relevant, with more direct lessons to be learned from the way the apartheid regime was dismantled and a national reconciliation process put in place. The similarities are there for all to see. In South Africa, apartheid was the cornerstone of the social structure of the society with a majority of population being denied their human rights solely on the grounds of their race. Lawful oppression in the form of apartheid was further compounded by unlawful violence against the opposition and dissidents. In Iran under the Islamic Republic too, discrimination on the grounds of gender and beliefs, enshrined in the law, deprived a vast majority of the population of their basic human rights. 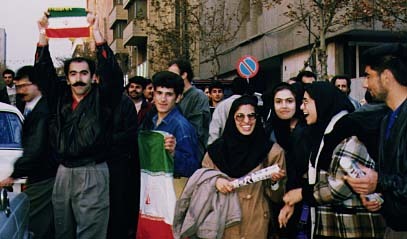 This majority (consisting of women, non-Muslims, non-Shia Muslims and non-clergy) has continuously suffered under the Islamic Republic, from denial of their basic rights to undergoing torture and executions, sometimes as a direct result of discriminatory laws (e.g., stoning women to death) or solely for who they were rather than what they did (e.g., Baha'is and "apostates"). The Islamic Republic, in spite of all protestations to the contrary, has turned Iran into yet another apartheid regime. Additionally, widespread use of torture and executions of political opponents and dissidents inflicted more suffering on the population at large. Against this background, the successful transformation in South Africa to a democratic rule, almost unthinkable only a few years back, provides one of the best models for a peaceful and constructive approach to national reconciliation in Iran. If the overtly apartheid regime in South Africa, with such poor record on human rights and with systematic use of violence, could in a matter of a few years peacefully turn into a modern democratic system with little upheavals, so can Iran with its covert apartheid structure and comparable poor record on human rights. However, such a transformation could not take place without a leadership which could inspire hope and trust and a sense of justice in those who have been wronged, and at the same time assure the perpetrators of the violence in the apartheid regime that the new order would not embark on revenge or retribution. The two aspects of this leadership could only go hand in hand in order to secure a successful outcome. Failure to deliver the first, could only alienate the oppressed population, with no guarantee that the old order will not return (a situation very familiar in Chile and Argentina of today). On the other hand, if the leadership could not give water-tight assurances to guardians of the old order that the new regime would not resort to revenge but will punish the perpetrators of violence and oppression in a humane way, there would have been little chance of the agents of violence handing power over to the new regime. Faced with an almost certain death sentence, there is no incentive for a criminal to give up the fight and surrender to their captors, even if in such a fight more violent crimes are to be committed. The answer to this double-purpose strategy in South Africa was the Truth and Reconciliation Commission combined with total abolishment of the death penalty and incorporation of the human rights standards in the new constitution. The Truth and Reconciliation Commission is there to investigate the truth about apartheid and all the violent activities which took place under that regime. It had to be independent of the judiciary which had itself acted in the past as an instrument of oppression. Moreover, and this is as important as the first, the Commission is charged with investigating not only the violence committed by the state and its agents but those committed by the opposition forces too. Its job is to shed light on the dark chapters of the countries' recent history and let a nation face the truth about its past and come to terms with it. The third case we study here is that of Northern Ireland with its peace process ongoing as we speak here. Here, the common factor with the Islamic Republic is the religious dimension of the conflict, religious discrimination, and the abuse of religion in both politics and violence. However, the precarious peace process which is now underway, has had to deal not only with these structural causes of the conflict but also with healing the scars of violence which had been going on for over two decades. The latter has proved much more difficult to handle and more complicated to resolve. Indeed, this very fact was one of the main reasons why the process initiated by Britain's Conservative government in 1995 failed. The government had persistently refused to address the excesses of the security forces in the past and tried unsuccessfully to do a Chile/Argentina act of forget and forgive. This was not acceptable to the families of the victims. They were evidently willing to forgive - once all the facts were known - but not to forget. A particular example of such concern was the killing by security forces of peaceful demonstrators in what has become to be known as 'Bloody Sunday' in January 1972. Finally, it was an announcement by the Britain's new Labor government early this year to set up a new inquiry with full power that broke this deadlock and gave the peace process a boost. The aim of the inquiry is, in the words of the British prime minister, ``simply to establish the truth and close this painful chapter once and for all.'' He also echoed the wishes of the families whom he had already met in the following words: ``They do not want revenge. But they do want the truth''. Again, similar to South Africa, it is the truth of the events that matters and not revenge and retribution. He concluded his words by saying that the inquiry ``is the way forward to the necessary reconciliation which will be an important part of building a secure future for the people of Northern Ireland''. Another lesson from the peace process in Northern Ireland is the way the authorities had to deal with various military groups. Again here, the Conservatives had failed to recognize the fact that military groups, no matter how big or small, have a disproportionate power in destroying the peace, if not in building it. And again here, a brave Labor Minister, Mo Mowlem had the vision and tenacity to take the bull by the horn, so to speak, and talk to all the military groups from both sides of the divide - to the extent of going inside prisons and meeting convicted members of these groups in order to convince them to support the peace process. And the strategy worked! Today the people of both Northern and Southern Ireland are preparing to go through a referendum for an agreement already signed by major political parties of the North as well by the two governments in London and Dublin. Some small extremist and para-military groups are campaigning against a 'Yes' vote, but the polls show that the peace process has overwhelming support amongst the population. The policy of the Labor government to heal the wounds of the past and isolate these minority groups (not by suppressing them but by direct talk to them) has proved successful. A society torn apart by sectarian strifes and killings over two decades is coming to peace with itself. 1 - The first and foremost step in this direction is to remove any obstacle in the way of a national reconciliation and preempt any potential resistance to it. Assuming that there's a genuine desire for such a process, it should be recognized that those who have something to lose would put up a resistance to it. Amongst these groups, perpetrators of crime and abuse of human rights and especially those who have been involved in torture and killings will have most to fear. And if any of these people fear that under the existing laws of qessas and retribution they may face the firing squads, it is a certainty that they would commit any act imaginable to prevent the transformation to democracy from happening. They need to be assured that, though they may be prosecuted, but never going to be killed. As part of this assurance, death penalty has to be abolished altogether. Otherwise, the whole process of reconciliation will be in danger of being sabotaged and killed outright by agents of violence and oppression before they are disarmed and overpowered. Abolishing the death penalty not only removes a powerful instinct of violent resistance from criminals but also signals a new and civilized chapter in the Iranian society making a clean break from its violent past. 2 - A genuine attempt and policy to heal the wounds of the past two decades so that those who have been wronged in these many years can feel vindicated and their sufferings recognized and, more importantly, that by exposing the causes of those crimes and their perpetrators, the society as a whole condemns those practices and so makes sure that they will not be repeated. Such a process should start with setting up a fully independent commission unrelated to the established centers of power and consisted of only members who have had no part in the power structure of the Islamic Republic. This then should be followed with the dismantling of the apparatus of oppression and annulment of all discriminatory laws, as well as re-organization of the much biased and oppressive judiciary so that those who are found to be guilty of any crime could be prosecuted in a fair and just judiciary system. 3 - Involvement of all sections of the society in the reconciliation process. It would be a great mistake if anyone thinks that by excluding a part of political spectrum or tendency, such a reconciliation could work. Of particular importance in this comprehensivity is inclusion of the armed and military or para-military groups and factions in the process. As mentioned earlier, even the smallest of such groups can easily destroy such a process if they can not have a part in its building. There are well-armed and dedicated para-military groups both in the government camp and in the opposition whose exclusion from the reconciliation process may lead them to resort to violence with unforeseen consequences both for the process and anyone who is involved in it. A reconciliation process can only be a comprehensive one - and nothing else. These are the basic preliminary steps which, judging by examples of Nicaragua, South Africa and Northern Ireland, when put together can be used as a model for a reconciliation process in Iran. The big question is, however, if such a desire exists and if the government of Mr. Khatami, with the massive popular support behind it, has both the vision and the courage to initiate such a process - or else, if Iran is heading toward yet another cycle of violence and oppression. Only time will provide us with an answer to this question.